Your documents and papers will have a dedicated new home where you need it. 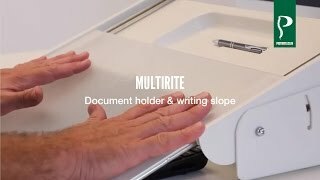 The MultiRite Document Holder from Posturite is the luxury document holder you've been waiting for. Deter repetitive stress injuries and organize your desk space with its angle adjustments and useful sliding top, which allows you to position documents above or even on top of your keyboard when you don't need to type. Secured by rubber feet so you never have to worry about it moving from place. Functional, handy ergonomics at your service. Dimensions 20.1" x 13.8" x 4.7"
slope angle is perfect, suggest that the width increase to 1 cm more than A4 paper.